We are pushing the start date back for Celebrating Families! to February 12th in order to get a few more families through intake/registration. Which means the program will end June 4. Please call or email me if you have questions. The attached referral can be sent to me. I will be sending out an updated flyer once it is completed. Behavioral Health still has open spots for the Celebrating Families! Program. 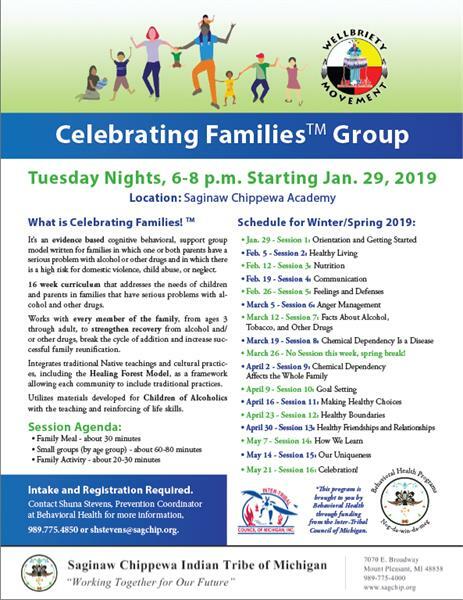 If you or a family you know would be a good fit to participate in this Evidence Based group for families affected by chemical dependency (current or in recovery), then please contact Shuna Stevens, Prevention Coordinator for Behavioral Health, for more information, a referral form, or to schedule an intake (989) 775-4850. It’s an evidence based cognitive behavioral, support group model written for families in which one or both parents have a serious problem with alcohol or other drugs and in which there is a high risk for domestic violence, child abuse, or neglect. 16 week curriculum that addresses the needs of children and parents in families that have serious problems with al-cohol and other drugs. Works with every member of the family, from ages 3 through adult, to strengthen recovery from alcohol and/or other drugs, break the cycle of addition and increase suc-cessful family reunification. Integrates traditional Native teachings and cultural practic-es, including the Healing Forest Model, as a framework allowing each community to include traditional practices. Utilizes materials developed for Children of Alcoholics with the teaching and reinforcing of life skills.  March 26 - No Session this week, spring break!  May 21 - Session 16: Celebration!